Growing up, my mother would often serve big bowls of porridge with plenty of sugar on top. Even during the summer in the Catskills, but with heaping spoons of freshly picked blueberries – my favorite way. In Russian, we call it mannaya kasha, which is basically wheat semolina based Cream of Wheat, made with milk. Not exactly a breakfast of champions. What did I know, I thought it was normal to get bloated and feel the need to pass out soon after. Needless to say, this is a better porridge option without the belly-aching, sugar-crashing side effects … what I like to call the ‘new and improved’ version of breakfast porridge. A whole lot healthier and I must say, a whole lotta DELICIOUS. I came across the recipe in Amy Chaplin’s cookbook at home in the whole food kitchen. 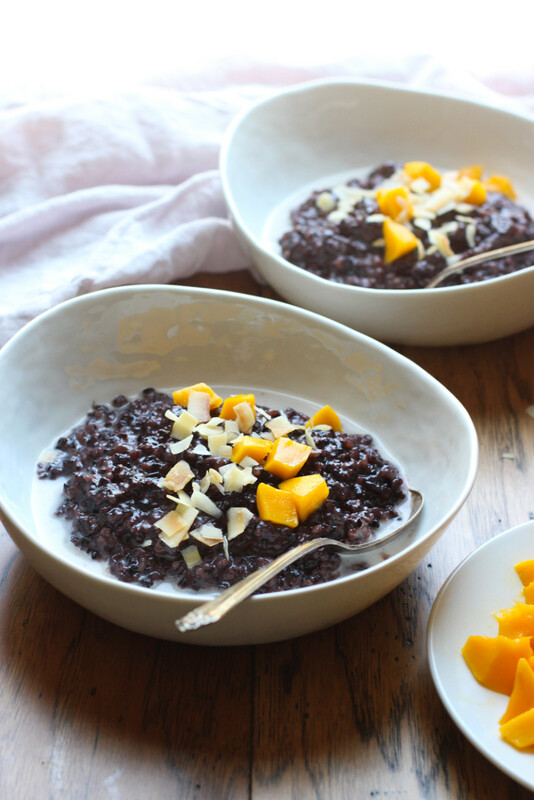 I thought it was clever to use the superfood, forbidden rice, in porridge and liked the idea of making a big batch on the weekend while doing laundry for quick, nutritious breakfasts during the week. I was intrigued but went with it and happy I did because we are hooked! 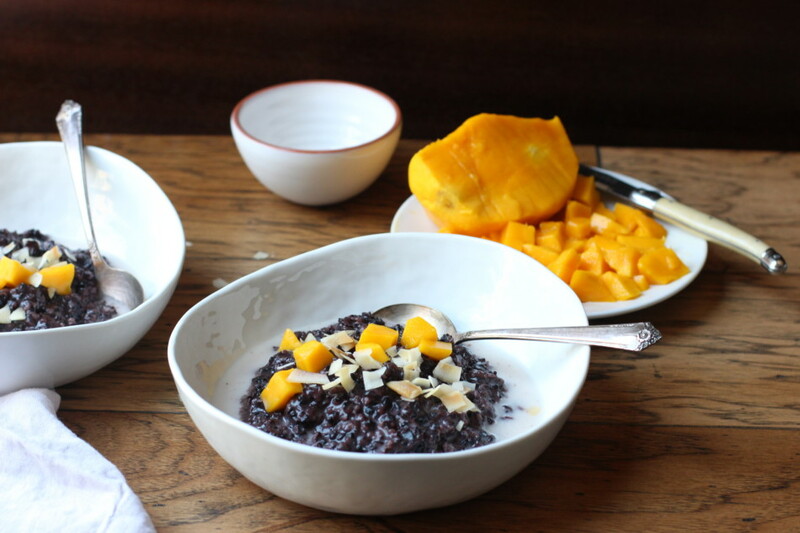 The first time I tried forbidden rice, also known as Chinese black rice, was a few years ago in the Caribbean, served as a cold salad tossed with nuts and mango. Before that, I’ve never heard of it. 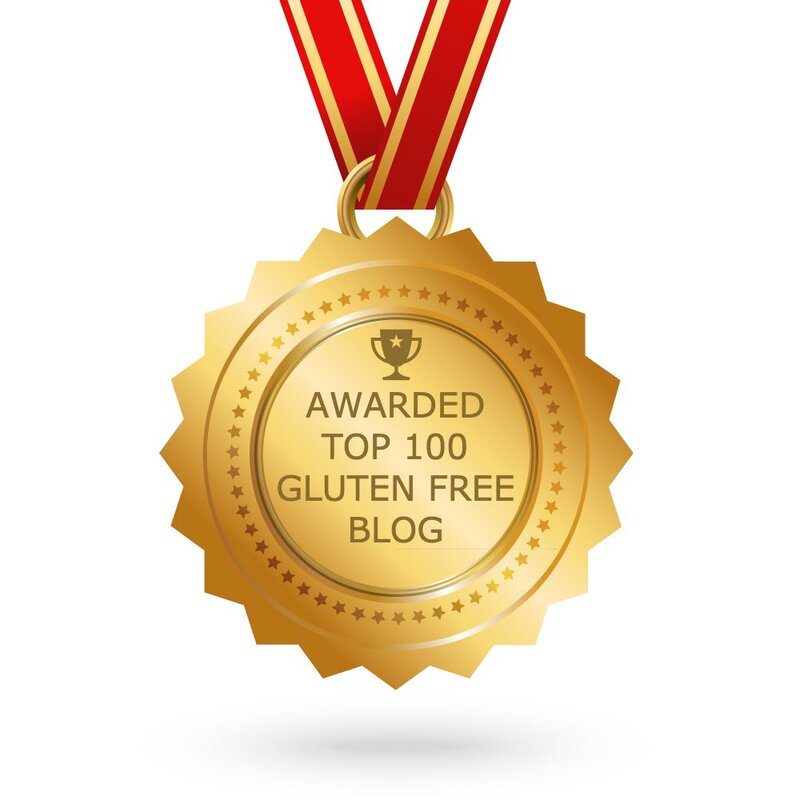 Little did I know, this ancient grain is the highest in protein (10 grams per cup), fiber, and anti-inflammatory anthocyanins of all rice varieties (more about benefits of anthocyanins here ). What makes this different from a rice pudding is the finer texture of the rice since it has been soaked overnight, and it’s far less sweet and custardy than the dessert. It does have a sweetness to it, but not overly so. And despite the amount of coconut here, it does not taste like a tropical coconut cocktail. 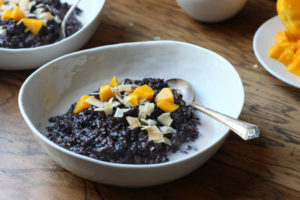 The creamy coconut is a mild back note to the hearty rice, and as far as taste goes, it’s grassier, or earthier, if you will than say long grain rice and lighter than brown rice. If you prefer a more dessert-like sweetness, drizzle on some syrup. We love fresh mango (or berries and bananas), but any seasonal fruit will do. Happy Monday! Easy to make and delicious to eat. 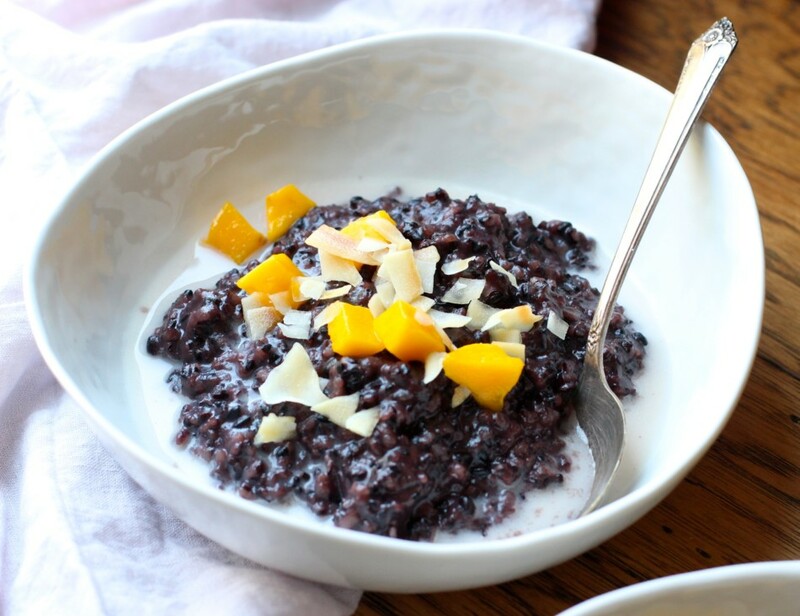 This superfood porridge can be served warmed or chilled and keeps well in the fridge for a quick go-to breakfast with your favorite toppings. Enjoy! Drain the forbidden rice and add to a medium heavy-bottomed (4 quarts) stock pot. Add canned coconut milk, creamer, water. Set on high heat and bring to a boil, then add kosher salt and coconut nectar (or syrup) and stir well. Cover, reduce heat to low, and simmer, stirring every few minutes, for 40-50 minutes. You will know it's ready when large bubbles appear on the surface, the stirring feels thick and resistant, and the rice has absorbed about two-thirds of the liquid. Frequent stirring will help break down the starches resulting in a creamier texture. The porridge will thicken as it cools or refrigerated overnight. Serve hot or chilled with additional creamer, coconut milk, or water for desired consistency then add coconut chips and fresh mango and serve. 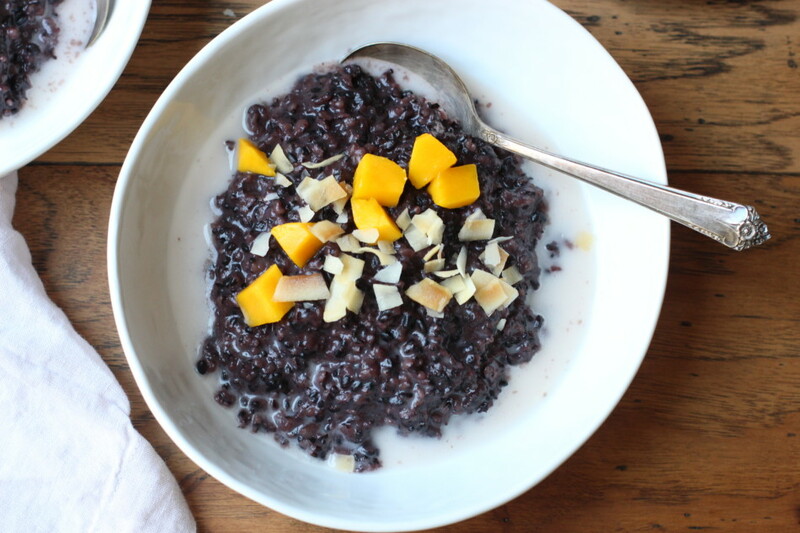 Forbidden black rice can be found in most health food stores or online. This also makes a lovely dessert with a scoop of fruit compote and non-dairy whipped cream (we love Coco Whip by So Delicious). Extra can be stored in the refrigerator for up to 5 days. It will thicken up further, simply add some of your favorite non-dairy milk and stir for desired consistency. What a combination .... this porridge looks yummy and is actually healthy for you? That's what I call an ideal dish. I couldn't agree more, hope you give it a try Paulette! Liking these light but untraditional summer recipes! Keep em coming!! It looks yummy and delicious. Thanks so much, hope you give it a try! I'm allergic to coconut and almond. 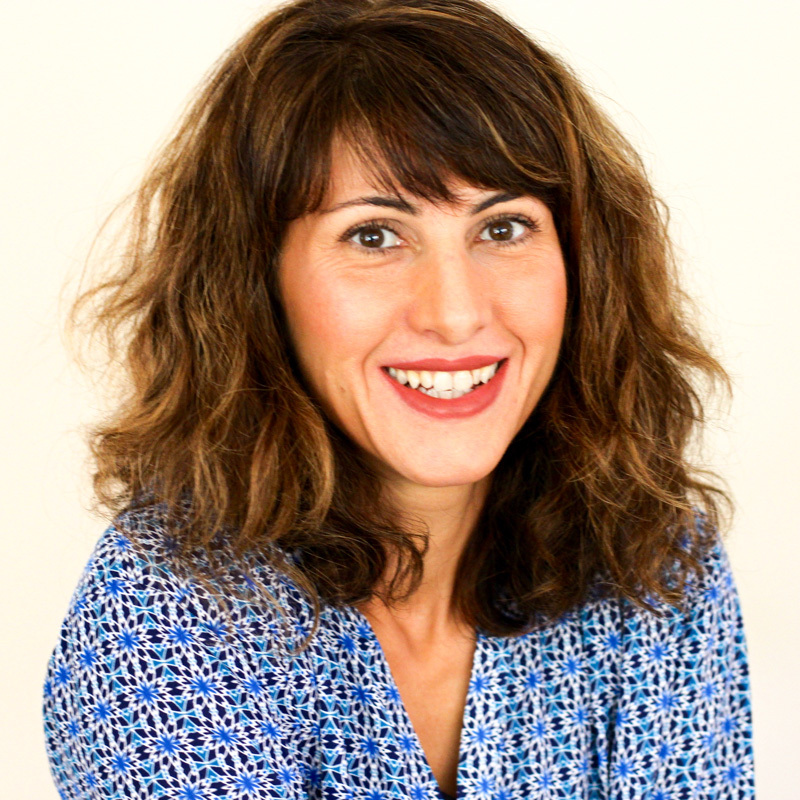 What other dairy free milk do you suggest with the same results? Thanks in advance. Trish, Rice, hemp or cashew milk will all yield good results. Enjoy! Found the rice at my Whole Foods to try the recipe with half maple syrup. I thought it was really good but next time will add the amount you suggested since it wasn't sweet enough. I added syrup on top with sliced peaches and flax seeds. Great recipe, thanks! Jessica, I made this today and topped it with peaches. Had to say thank you for the amazing recipe! 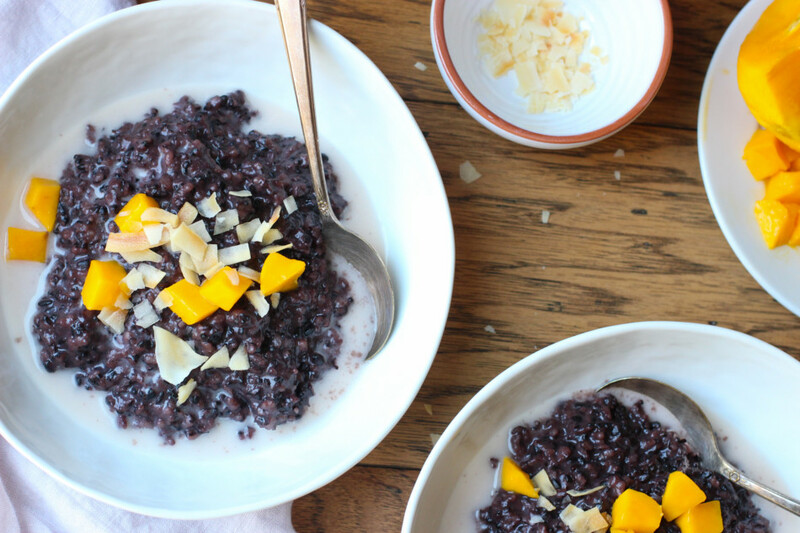 I am familiar with black rice and have made it as a side but never as a hot cereal. Happy I gave it a try! Will never think of porridge the same way again. I always hated it but my boyfriend loves it so I made this. This is nothing like the bland mushy kind I remember. I am now a converted porridge lover lol! This is a delicious new take on my breakfast cereal, thank you! I will definitely make it again but using less maple syrup next time since I don't have much of a sweet tooth but other than that it's the perfect breakfast bowl! I just finished a big bowl of this porridge for dinner because I love to have breakfast for dinner and it was incredible. Not only was it so filling it was easy to make after the soaking process. Great recipe! My only question is can I freeze portions to thaw a day in advance? So happy you love it! I have never froze this before so I can't say for certain. I have had it in the fridge for a week though - hope that helps! I couldn't stop smiling while eating, it is pure bliss. It doesn't feel heavy as I thought it may be. Such an easy recipe that I will keep on repeat. Thanks! !